Createspace Independent Publishing Platform, 9781451564846, 274pp. "Intoxicating. Poetic. Arresting. Powerfully bloody." - The New York Times Sunday Book Review. From the New York Times Bestselling author of THE SILENT GIRLS and LIE IN WAIT comes a smoldering and devastating literary crime novel in the tradition of Daniel Woodrell, Larry Brown, Chris Offutt, and heralded by the New York Times as "Intoxicating. Creepy. Poetic. Arresting. Powerfully bloody." In this hard-edged, quick-moving, and violent tale, a young fatherless boy is unwittingly lured into a murderous plot in the Gothic backwoods of Northern Vermont when he bonds with a paranoid ex-con he's unaware is bent on revenge. All tempered by a fine lyric sensibility and an awareness of people and place that sings with evocation and authenticity. Taut, riveting, and unflinching, REAP draws readers into the dangerous and claustrophobic backwoods of Northern Vermont to witness a hard-edged, quick-moving, and violent story charged with fate, bad blood, and family secrets, tempered by a fine lyric sensibility and an awareness of people and place that sings with evocation and authenticity. A masterwork of literary crime fiction heralded alongside Denis Johnson, Russell Banks, and Robert Stone. 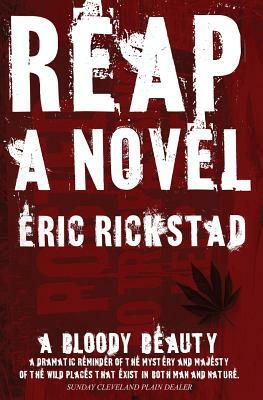 Eric Rickstad is the New York Times, USA Today, and International Bestselling author of the forthcoming THE NAMES OF DEAD GIRLS, THE SILENT GIRLS, LIE IN WAIT and REAP. His novels are heralded as intelligent and profound, dark, disturbing, and heartbreaking. He lives in his home state of Vermont. He is represented by Philip Spitzer of the Philip G. Spitzer Literary Agency.